A filling replaces natural tooth structure that has been damaged due to decay or fracture. Composite fillings, also known as bonded fillings, both look natural and reduce the amount of tooth structure that is removed in performing the restorations vs. amalgam (silver) fillings. 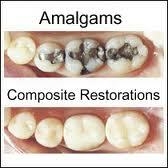 Our office exclusively uses white composite filling material in restorations. We will replace your old, broken down, amalgam fillings with white composite to restore your smile and give your teeth to a more natural look and feel.